I’ve had scones on the brain since the last time I made them, which feels like it was ages ago. 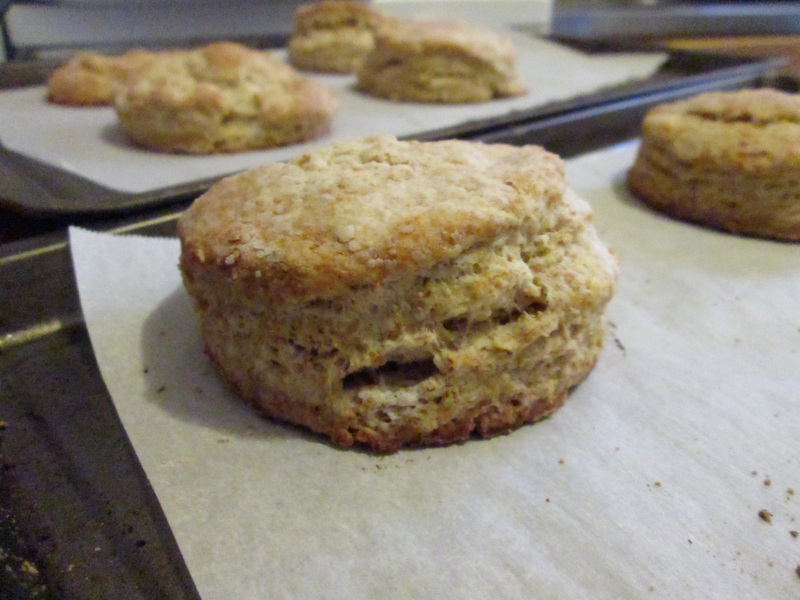 There’s something awesome about scones that makes me want to keep eating them all the time and forever. It might be all the butter and cream, to be honest. Since I have been dreaming about scones, I couldn’t decide what flavor to make them. I’ve had success with pretty much any flavor in my house because apparently, I’m not the only one with a scone fixation here. I’m not sure if I mentioned it here before but I am done with pumpkin for the time being. I went HAM last year with the pumpkin recipes and decided this was the year for apples. Pumpkin anything seems so played out these days. Like, Starbucks brought out the Pumpkin Spice Latte in August. AUGUST! It wasn’t even remotely close to fall weather then! I don’t know but that kind of takes out the novelty of things when they’re brought out too early; kind of like putting Christmas decorations on sale in September. As much as I love Christmas and the holiday season, it’s not time for that yet. For me, this is apple season. I already made and posted one apple recipe this season, but I have a couple more up my sleeve. When my dad isn’t ranting about his OTM (one true muffin), he’s eating apple things. With that in mind, I set out to make apple cinnamon everything and I’m not even done. 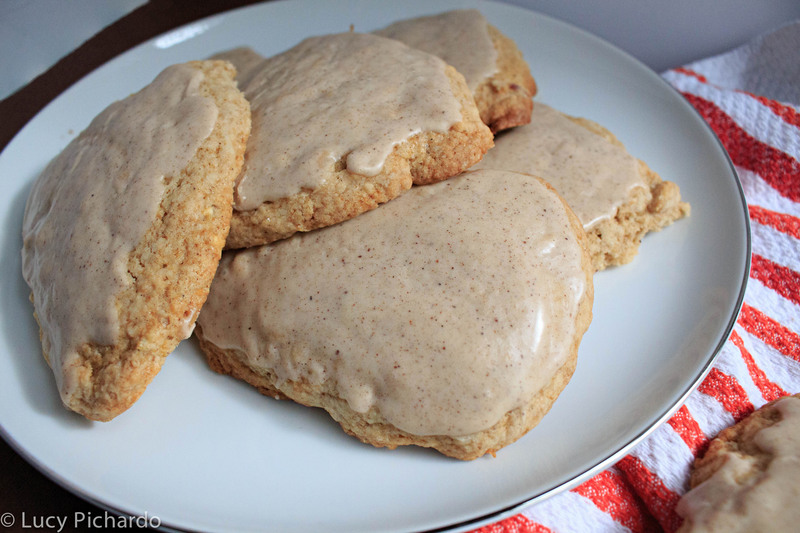 For today though, let’s talk about scones. Like I mentioned before, there’s something about scones. I still don’t know what it is but there’s a distinct scone taste that only certain scones have. I briefly mentioned it the first time I made them here but I can only imagine it has something to do with butter. Speaking of that first time, I used the same recipe but modified it to use apples and cinnamon for a more seasonal offering. Besides swapping out the orange for apples and cinnamon, I opted for cream instead of milk. Decadent much? Hell yes! I just feel that butter and cream both belong in scones at the same time. No other way about it. For the apples, I used McIntosh because it was the only kind I had around. They’re not the optimal apple to bake with though, and work better when used in conjunction with other apples. For example, my one true apple is the Granny Smith. It’s perfect for baking because its flavor is still there, they’re sturdy, and still have a bit of bite to them even after being baked. If I make these again, I’ll definitely change the apples from McIntosh to Granny Smith (and suggest you do the same, too). I also grated the apple instead of chunks because I wanted the flavor to be ‘equally distributed.’ Might’ve backfired on me but it can probably work with a Granny Smith, as opposed to the soft McIntosh. Even though I had slight moisture issues with this batch (again), they came out delicious. Unfortunately, they spread out quite a bit in the oven and barely held their shape. This probably happened for two reasons; the butter got too soft in the batter and because of the excess moisture. 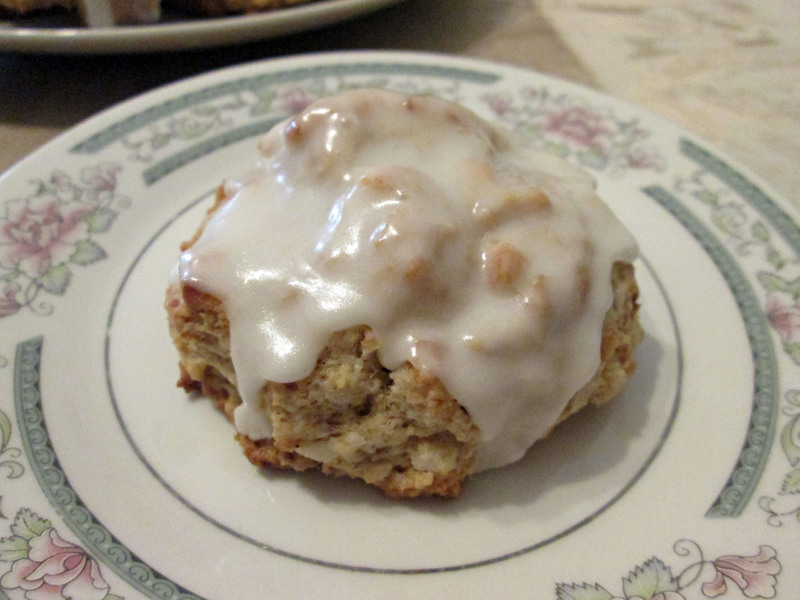 And then because of my choice of apple, their flavor kind of disappeared in the scone. Upsetting but nothing too bad. 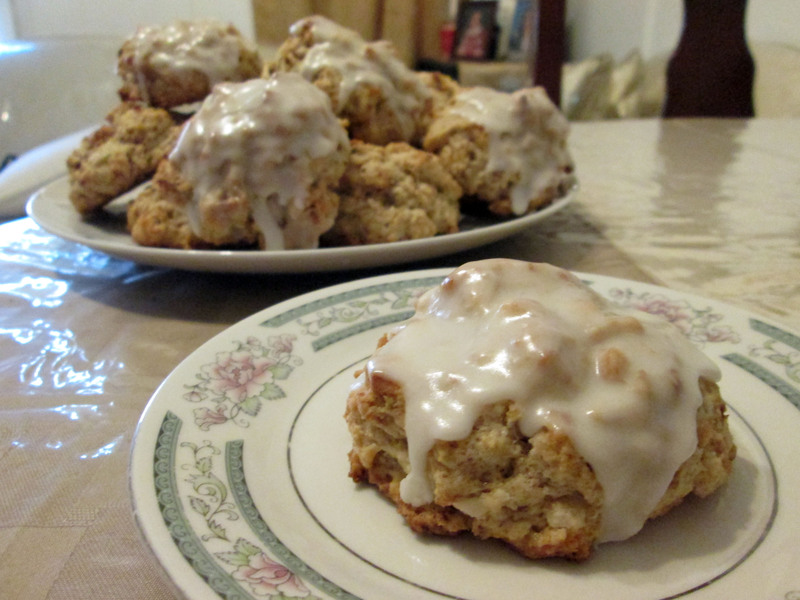 They still had that scone taste that I love, and were very cinnamon-y. I topped some of them with a cream and cinnamon glaze to amp up that fall flavor. SO GOOD! Mind you, these aren’t very photogenic. As much as I tried to make them look appetizing, it didn’t really work. Trust me when I tell you they were delish, especially since they were gone within a day. I guess I’m really not the only one with a scone fixation! Preheat the oven to 350F. Line two sheet pans with parchment and set aside. Whisk together the flour, baking powder, salt, ground cinnamon, and sugar. Mix well. Cut in the butter, either with a pastry cutter, forks or your fingers, into the dry ingredients. Continue until the butter chunks are about the size of peas. Add the grated apple and mix well. In another small bowl or measuring cup, whisk together the egg, milk, and vanilla extract. 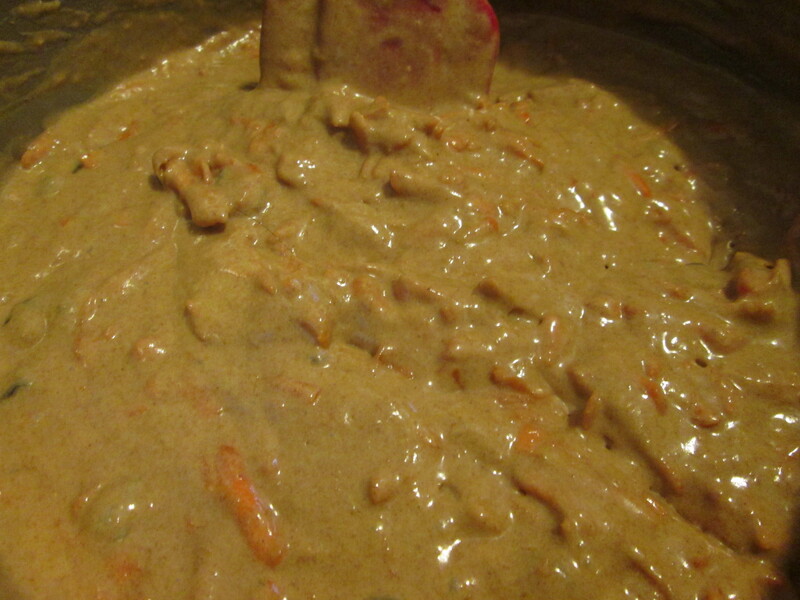 Stir the wet into the dry ingredients until dough comes together and everything is well moistened. 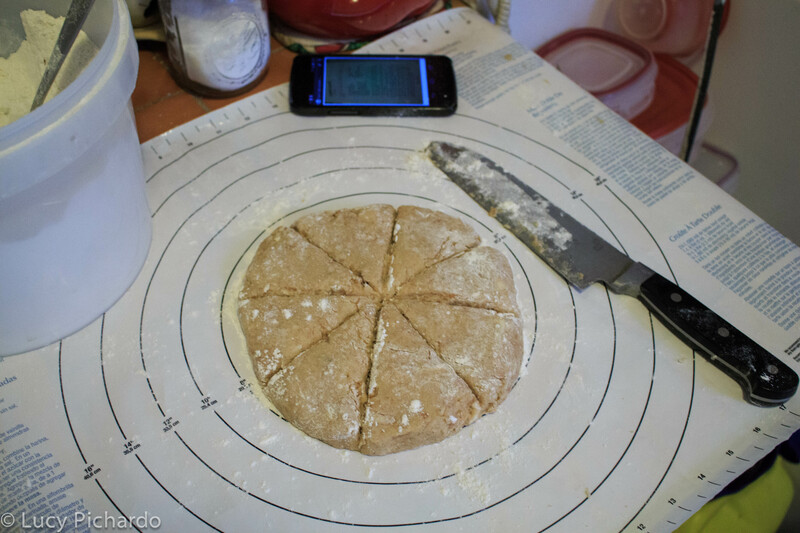 Divide the dough in half and form each into a ball. Flour a clean work surface and pat down each ball to form a 6-7″ circle. Roll out the circles until they are 3/4″ thick. Cut each round into 8 wedges. Repeat with the second dough ball. Arrange the wedges on the pans without any crowding. Sprinkle with sugar (optional), and bake for 20-25 minutes. Serve warm if unglazed. In a small bowl, sift the powdered sugar. Add the cinnamon and whisk together. Add in the heavy cream and vanilla, and mix until sugar is moistened. Stop here if you like your glazes thick. If not, add in the milk. 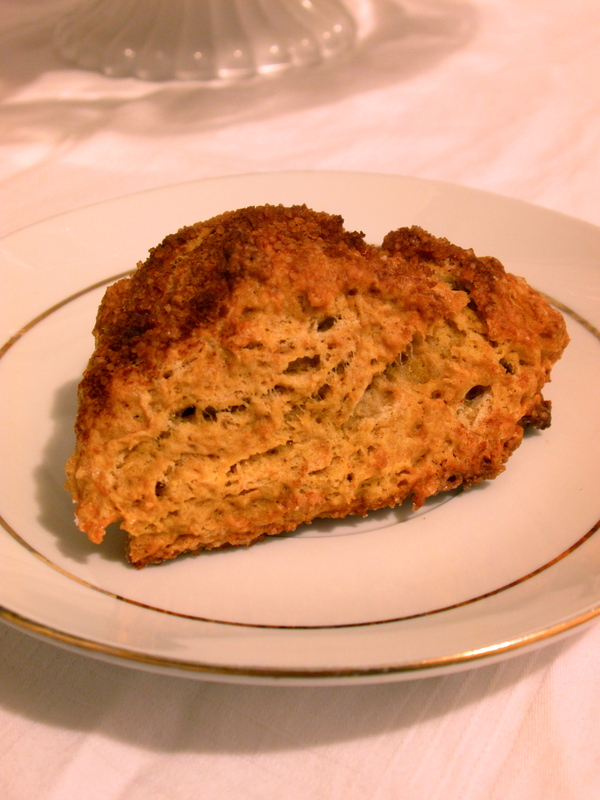 Drizzle or dip your cooled scones in the glaze. Set the glazed scones on a wire rack to set. Use any firm apple you’d like for this recipe. 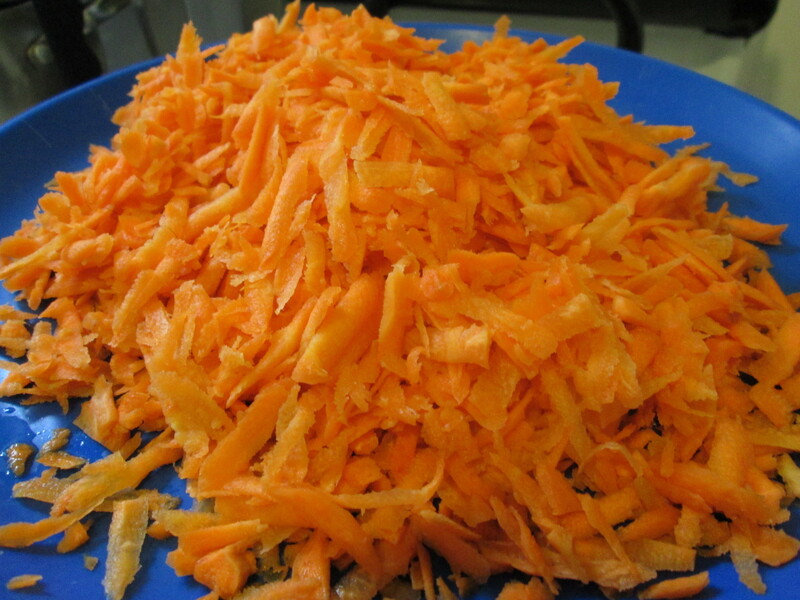 You can also opt for chunks instead of grated apples. 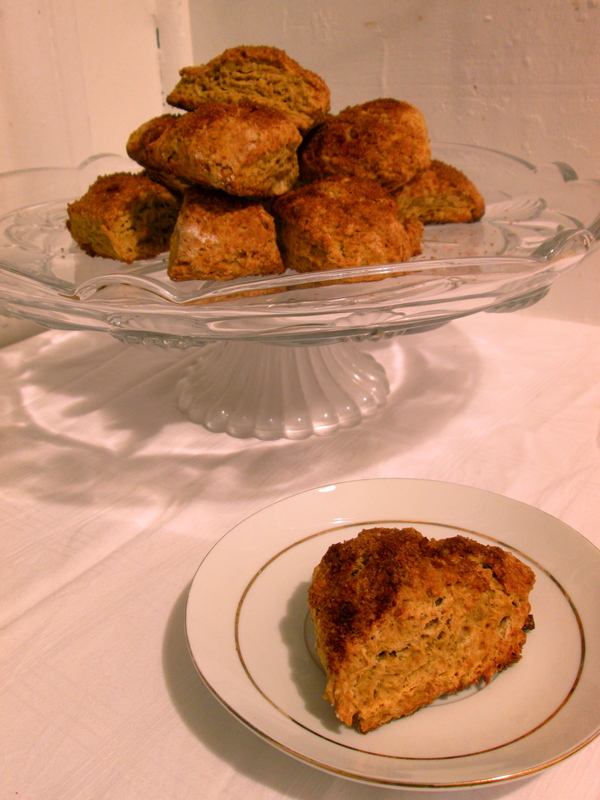 To prevent your scones from spreading, freeze the wedges for 10-15 minutes before baking to help the butter set back up. To glaze all of the scones, you might need to double the glaze recipe. To amp up the apple flavor, you can also use a tablespoon of apple juice in the glaze. Sounds weird but it could work! Ah, the fall. It’s finally getting chilly, the leaves are falling, and I can wear a jacket out without immediately suffering from heatstroke. I’m excited about the weather and upcoming holidays, among other fall things. The best part about the fall, though, is that the best fruits and vegetables are now in season! Of course I’m talking apples. Technically, they’re always in season but apples are in their prime in the fall. I’m dying to go apple picking one day. I’d make apple EVERYTHING. Yeah, right; I’d probably eat more than half the apples straight up! Anyway, I planned on making a bunch of apple things this fall and may have a couple more recipes up my sleeve, but let’s start with these muffins. I’ve discussed a few times on here how much of a muffin fiend my dad is. While he believes the corn muffin is the “one true muffin,” he can’t really say no to anything apple related. 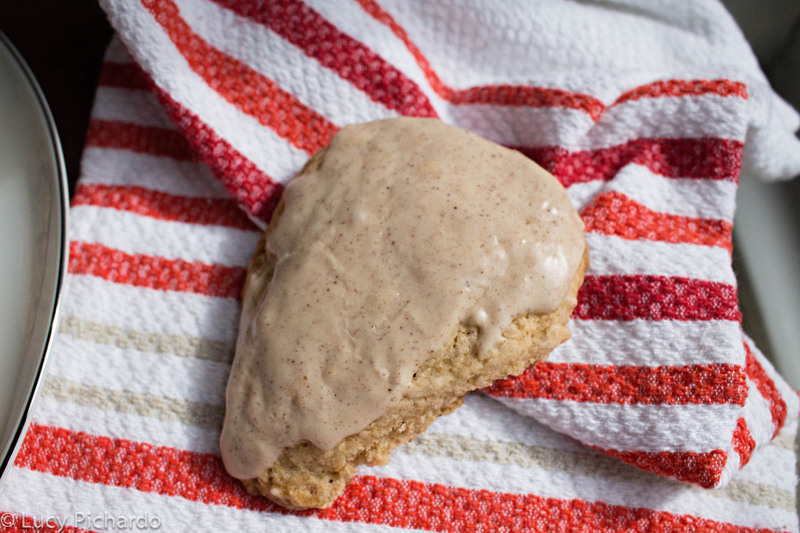 Apple cinnamon is one of his favorite combos for pastries. I’m talking turnovers, danishes, pies, whatever. Out of all of those things, I’ve only attempted one and did not get his seal of approval. Sad, but I’m working on it! I decided on muffins for my first apple entry this year because of my dad, and because I wanted to switch things up a bit. 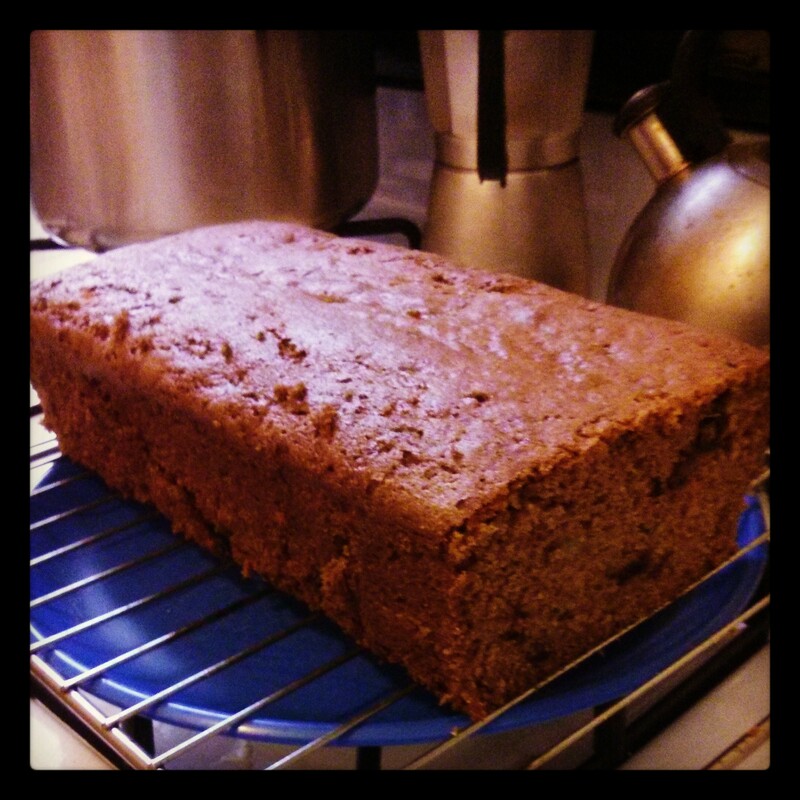 Last year, I made an apple cake (from one of my favorite bloggers) that went over really well. I wanted to remake that success but in miniature form. The muffins themselves are actually pretty simple, which almost guarantees its deliciousness. Before I get into the muffins themselves, let me wax poetic about these liners. If you’ve been following me since last fall, you know how I feel about muffins in cupcake liners. They’re a no go for me. Now, the recipe states to use these things and then grease them. WHO DOES THAT?! How do you even grease a cupcake liner? I don’t know but that doesn’t make sense to me AT ALL. I went to Target (holy grail) a couple months ago and bought these liners, in preparation for some cupcakes I had planned. I didn’t use them to make the cupcakes (go figure) but considered them for these muffins. I had a mini internal debate right before it but I went ahead and used them. 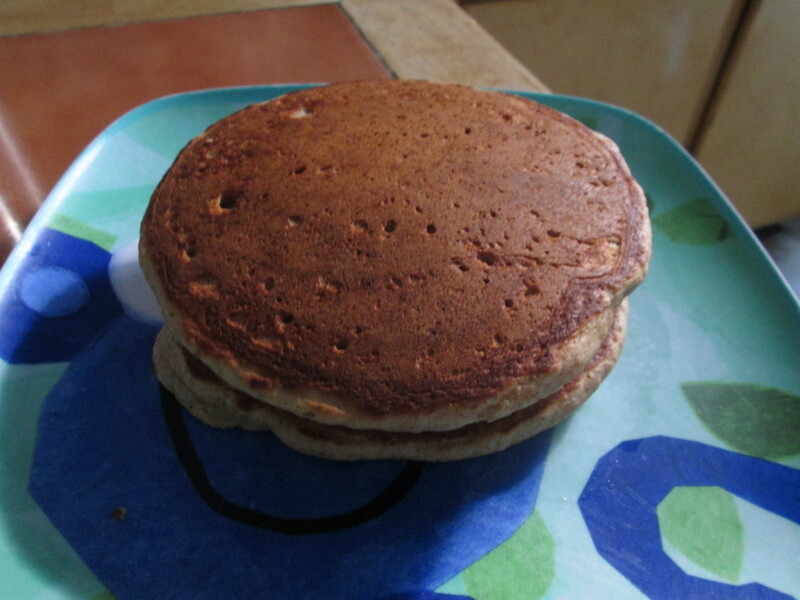 Since they’re parchment, I skipped the greasing (still a weird concept to me but okay). Can I just say these things are the biggest blessing to my non-cupcake-liners-for-muffins heart? OMG NOTHING STUCK TO THESE LINERS. N O T H I N G. I was amazed, thrilled, and surprised with the result. I mean, see for yourself. The muffins came clean off the liner. 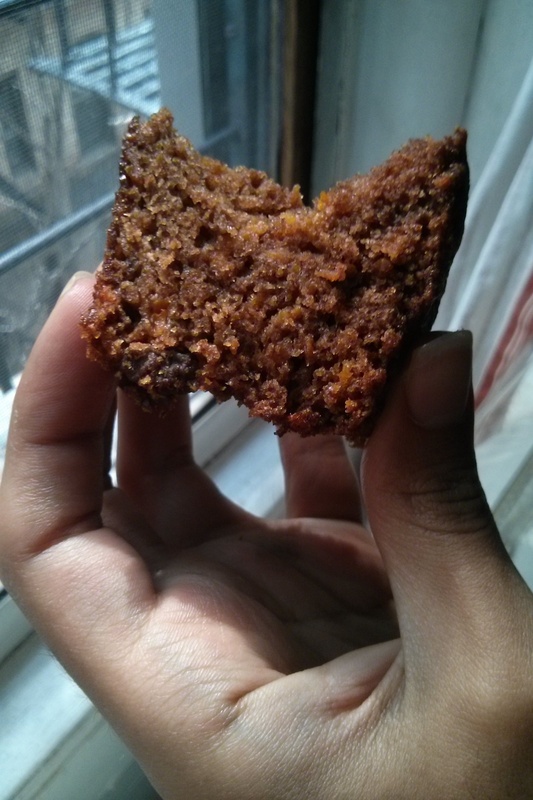 I got to enjoy the ENTIRE muffin, without a single crumb sticking to the liner. Very impressive, Target. Four for you. Back to the muffins. They were awesome. Just the right amount of cinnamon and apples. I should’ve cut the chunks a tad smaller, but will keep that in mind for the next recipe. 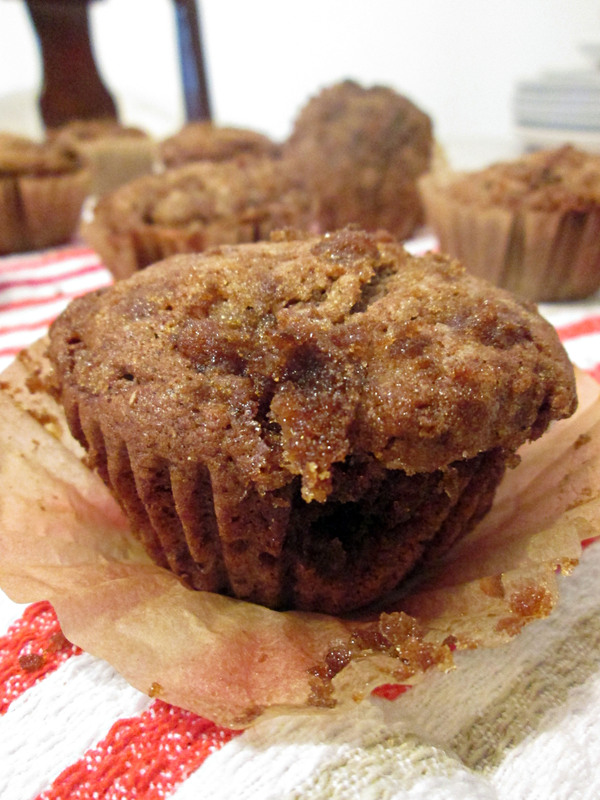 The cinnamon sugar topping goes perfectly well with these muffins, considering the muffin itself isn’t that sweet. It was fluffy and moist too, thanks to the buttermilk. Besides the fact that the muffins were delicious, I was way too impressed with the functionality of these liners. I’m still impressed, actually. For my first apple recipe this season, I think it went pretty well. I can’t wait to see what else I can come up with! Preheat the oven to 375°F. Grease and flour a 12-cup muffin pan, or line with magical parchment cupcake liners and skip the greasing all together. No magical liners? Grease regular paper liners instead. 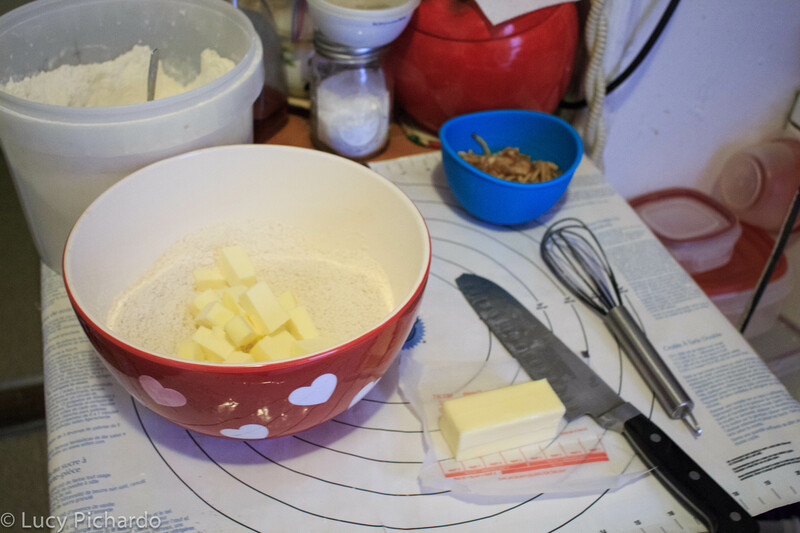 Mix together the butter, granulated sugar, and 1/4 cup of the brown sugar, beating until fluffy. Add the egg and mix well, stopping once to scrape the sides and bottom of the bowl. Gently mix in the buttermilk. At this point, the batter will look curdled and gross. It’s supposed to, so keep going! Stir in the flours, baking powder, baking soda, salt, and cinnamon. Fold in the chopped apples. 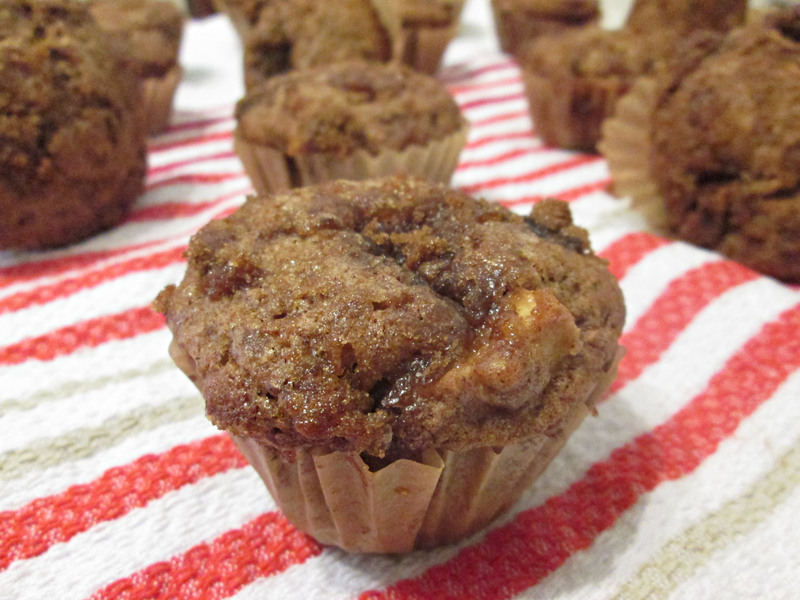 Divide the batter evenly among the prepared muffin cups, sprinkling the remaining 1/2 cup brown sugar on top. Bake the muffins for 25 to 30 minutes, or until a toothpick inserted into the center of a muffin comes out clean. Get those magical liners. Worth every penny! I tossed my apple chunks in a bit of cinnamon and flour before folding them into the batter. 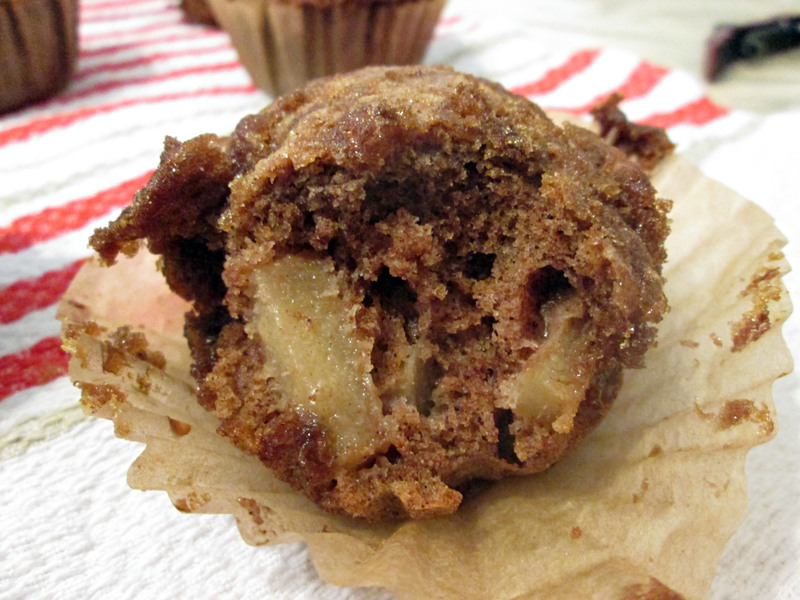 The cinnamon was for extra flavor but the flour was so the apples wouldn’t sink to the bottom of the muffin. Top the muffins with the sugar topping a tad sparingly. Melted sugar is a pain to get off the pan, just saying. Use a disher or ice cream scoop to help evenly distribute the batter among the pans. Helps get consistent muffins, and ensures they’ll all be done at the same time. Doughnuts have been on my to-make list for what feels like an eternity. It’s one of those simple desserts that seems approachable but is really elusive; at least to me. Doughnuts (or donuts) are really flippin’ delicious. My favorite is probably jelly because hello, raspberry filling plus granulated sugar on a puff of fried dough is just perfection. Of course, I’m talking about Dunkin’ Donuts. The words “perfection” and “Dunkin'” don’t really belong in the same sentence (or even alluded to it), but I digress. What makes doughnuts delicious is that it’s fried dough, and therein lies my first roadblock. I don’t really have a problem with fried food. Some of my favorite foods are fried (ahem, fries) but there’s just something about boiling something in scorching hot oil that turns me off. Essentially, I have a fear of frying. Hot oil is kind of scary. Not only that but if you don’t have the proper equipment and environment, deep frying is a recipe for disaster. As much as I wanted to try frying, I didn’t want to risk it at the expense of our tiny kitchen/apartment. The obvious alternative is to bake them. I don’t know about you guys but baked doughnuts are somewhat of a copout. Especially those made in donut pans. I still think it’s ridiculous to have a specialty pan for these sort of things, like those whoopie pie pans that now exist for some reason. I can’t justify a donut pan purchase, despite the fact that I really want a pair. Doughnuts made in those contraptions are like a donut shaped cupcake/muffin; it’s just not the same. That’s why I smiled like an idiot when this recipe graced my inbox a couple weeks ago. I read the recipe and it seemed easy enough to pull off in an afternoon, and had potential to be delicious. I was also happy about the presence of yeast in the ingredients. Doughnuts usually take yeast, so I had a feeling these were gonna be for real. I’m no stranger to yeasted dough, considering I get down and dirty with a bowl of dough at least once a week. However, I was NOT expecting this dough to be that sticky. I had several mishaps (surprise surprise) while forming the dough into doughnuts. It was ridiculously soft and sticky, and I couldn’t lift the circles off my mat. It was a messy situation, hence why I don’t have any pictures of the process. I ended up adding quite a bit of flour and kneading the dough a bit, until it was slightly less sticky and easier to handle. I punched out my doughnuts using the same method from the Samoa recipe; a biscuit cutter and a milk cap. They came out looking like real little doughnuts! 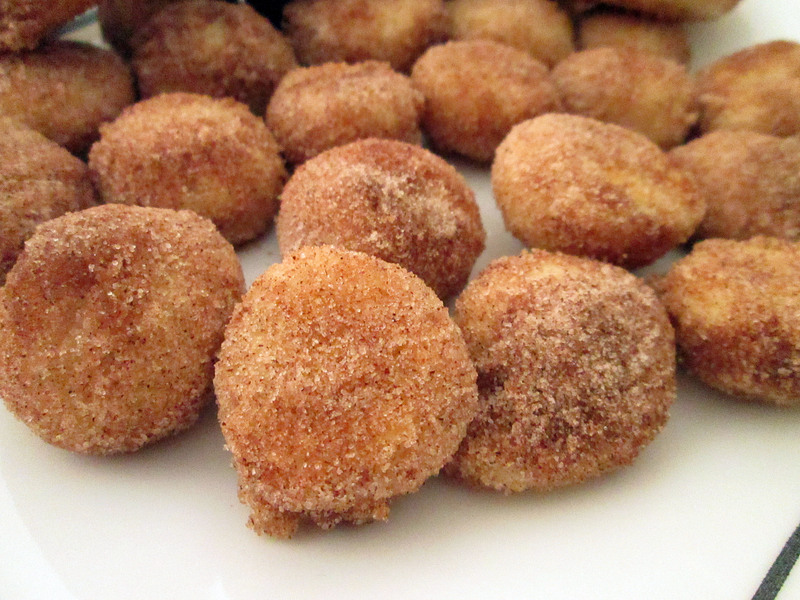 I even baked the doughnut holes, instead of re-rolling them into more doughnuts. In the end, I got 28 doughnuts and 32 donut holes. 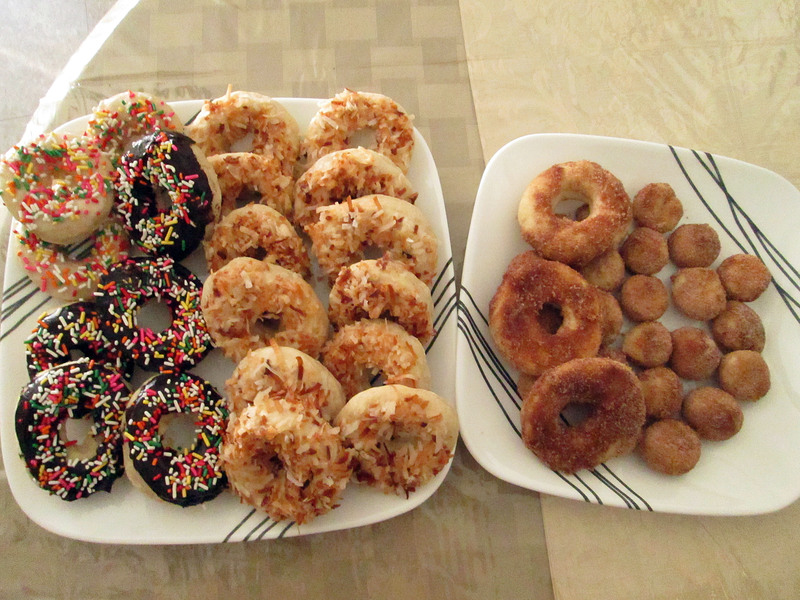 I was psyched about my sudden abundance of doughy rings, that I planned several different toppings. For the doughnut holes (and like, three doughnuts), I tossed them while warm in some melted butter and then in cinnamon sugar. 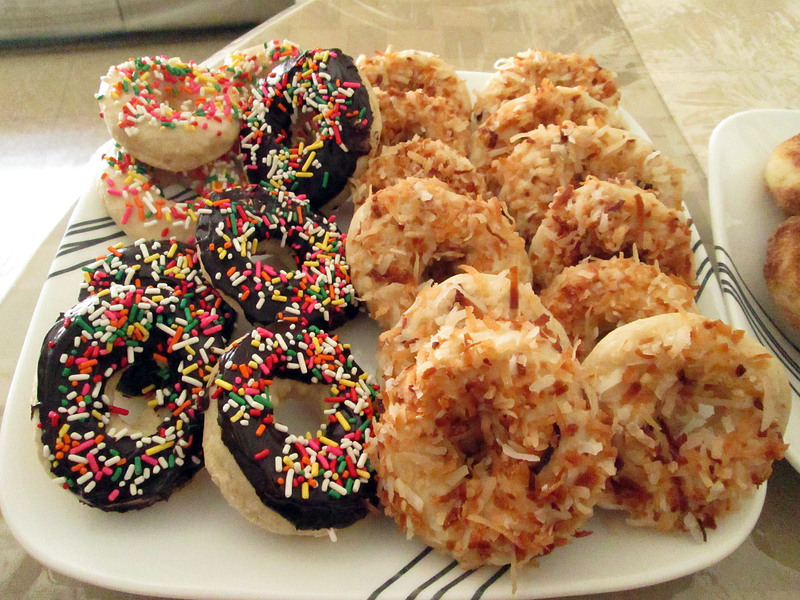 The majority of the donuts were dunked in a simple vanilla glaze and then covered in toasted sweetened coconut. The other stragglers were either dunked in the same vanilla glaze or in some melted semisweet chocolate and topped with sprinkles. On their own, these doughnuts aren’t anything to write home about. The dough is kind of bland and depends on the topping for any actual flavor. Despite this, the hint of cinnamon in the dough leaves you begging for more, and worked well with all of the toppings I used. I think that for next time, I will probably add a bit more flour to the dough, along with about a 1/3 cup of sugar and possibly an extra yolk. I’d also proof them after cutting them out into doughnuts. Overall, this was a great starter doughnut experience. I loved how the dough let the toppings shine but still brought its own subtle flavor to the mix. While I’m not ready to fry or cave and get those doughnut pans, these little rings, along with some tinkering will do just fine. In a small pot over medium to low hear, warm the milk, water and butter until slightly warm to the touch (about 95° to 100°). Whisk in the egg. In the bowl of an electric mixer fitted with the dough hook attachment, or using a large bowl and a wooden spoon, mix the flour with the salt and cinnamon. Add the yeast and the milk mixture and mix on low speed, or by hand until the dough begins to come together; 3 to 4 minutes. Increase the speed to medium and continue to mix until the dough is smooth (it will be pretty sticky), 5 minutes more. If mixing by hand, this may take an extra 5 minutes. Transfer the dough to a large bowl lightly greased with nonstick spray. Cover loosely with plastic wrap and let rise at room temperature until double in size, about 1 hour. Preheat the oven to 350° and line two baking sheets with parchment paper. On a lightly floured surface, roll out the dough into a ½-inch-thick rectangle. Using a small round cookie cutter or the rim of a small glass, cut out circles of dough. Use a smaller cookie cutter or glass to cut another hole in the center of each circle. Dip your cutters/glasses into some flour between cuts, to prevent sticking. Transfer the doughnuts to the prepared baking sheet. Brush lightly with melted butter and bake until golden, 10 to 12 minutes. Cool on a wire rack. 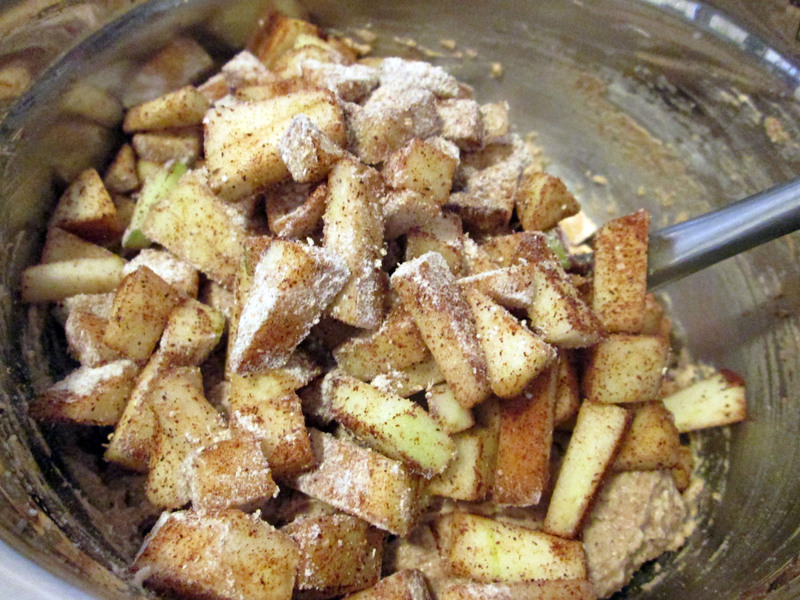 Mix together the sugar and cinnamon in a medium sized bowl. 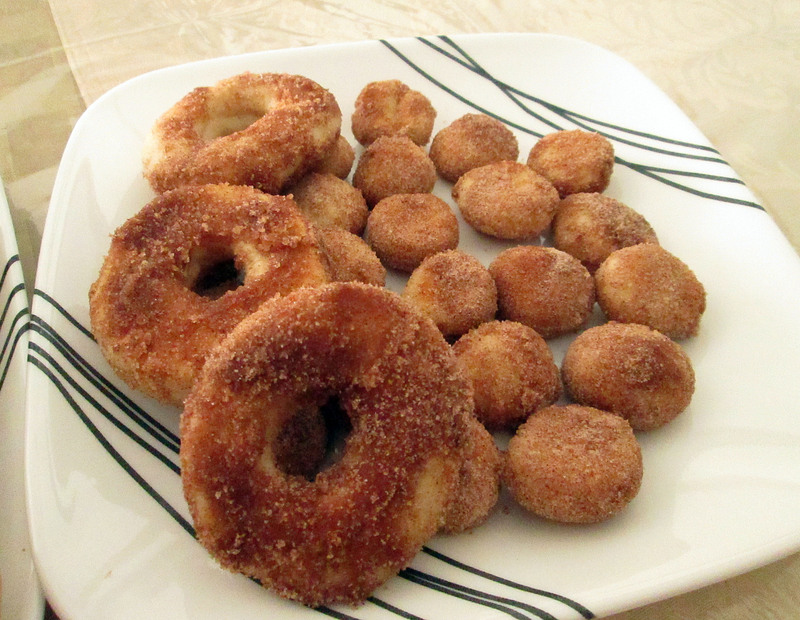 While the doughnuts are still warm, dunk them in melted butter and then toss in the cinnamon sugar. Take care not to do too many at the same time; the butter will moisten the sugar and it’ll get all clumpy and will not want to adhere to the doughnut. Combine the chopped chocolate with the butter in a heatproof bowl. Set over a small pot with some simmering water and melt gently. Stir frequently until melted. Remove from heat and use immediately. Sift the powdered sugar into a medium sized bowl. Whisk in the milk gradually, by the tablespoon, until it reaches your desired consistency. Stir in the vanilla extract, and use immediately. Echoing what I said above, I’d add about 1/3 cup of sugar, an egg yolk, and maybe 1/2 cup of flour to the dough next time. I’d also proof the doughnuts a second time after cutting out the shapes. The recipe calls for whole milk but I used soy milk just fine. For the vanilla glaze, it isn’t necessary to use all the milk; just keep adding until the glaze reaches your desired thickness. 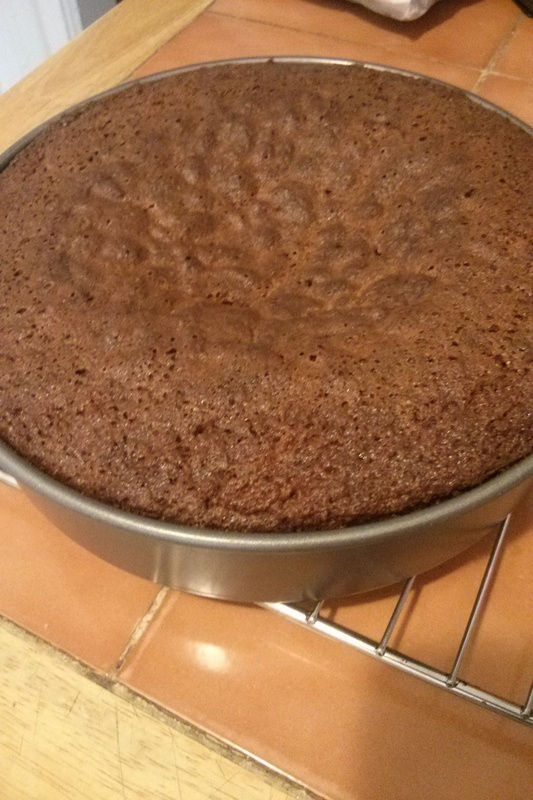 For the chocolate glaze, try not to get any water into the chocolate; it’ll seize and reach the point of no return.